Preheat oven to 180°C. Grease a 6-hole jumbo muffin pan. Place half the chocolate and the butter in a bowl over a pan of gently simmering water (don't let water touch the bowl) and stir occasionally until melted. Set aside to cool slightly. Sift flour, baking powder and cocoa into a large bowl and stir in sugar. In a separate bowl, whisk together milk and eggs, then add to dry ingredients and stir in along with chocolate mixture. Divide between muffin pans and bake for 20 minutes or until risen and cooked through. Remove and cool on a wire rack. Place remaining chocolate in a bowl over a pan of gently simmering water (don't let water touch bowl) until melted. Cool slightly, place a little chocolate on the Mars bar slices, then pile onto muffins. 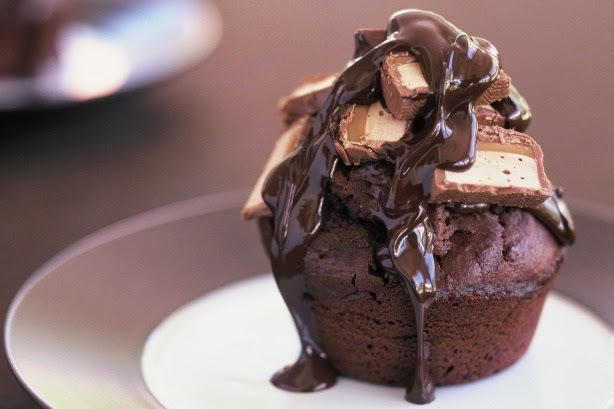 Drizzle with remaining melted chocolate.